What did it feel like, on that first day? ACCESS turns 40 this year, and we’ve been thinking a lot about what life was like in 1979 on the eve of its birth. The ADA had not yet been passed, and transportation options were limited for many in our county. So we spent some time with Janet, who registered for ACCESS on its very first day. 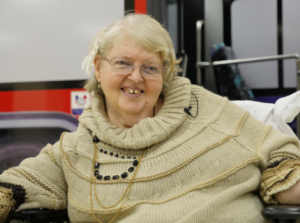 Janet was one of the fierce advocates who helped bring ACCESS to life, stressing the importance of a door-to-door service as the idea became a reality. She shared with us a little bit about the role ACCESS has played in her life over the last 40 years. Janet: My name is Janet B. Evans. I’ve been riding 40 years! ACCESS has helped me go to community college in my younger years, and I go basically wherever I want in Allegheny County. Interviewer: And you mentioned the buses. So you also use Port Authority Buses too? Janet: Yes. Yeah, to come downtown, it’s easier to take a bus. But in the winter months, I’m sure glad we have ACCESS. A bunch of us belong to the CAT Committee where we help advise the Port Authority. The CAT means [Committee] for Accessible Transportation. First of all, we all started back in ’79 as a pilot program with a lot of people like myself, and also seniors, as well as the City-County people…mass transit, [and] the Port Authority. As for who all started this…it was a group called Open Doors for the Handicapped. And my late husband was a part of that group, and when I got on board, we all started talking about lift vans. And believe me…that was the start of everything. Then we all had meetings, and then ACCESS was born. Through the years, like I said, I’ve been able to do what I wanted. I also had a business and I used ACCESS for that. But to tell you the truth, without that, I don’t know how I would’ve gotten around. You know, for many people to get out of their homes, especially seniors also, and people with severe disabilities. Which is a godsend, yeah. Interviewer: I was going to ask you, what would life be like without ACCESS, do you think? Janet: Well, let’s put it this way—I’d be stuck at home, you know, probably in an institution. Interviewer: So it helped you to live independently with your husband. Janet: Yes, I was married for 27 years. And I continue to do what I do. And ACCESS really helped me to live the way I want to live. Interviewer: Given how active you had been in getting everything to that point, what did it feel like on that day when you first registered for ACCESS? Janet: I was excited! I mean, it was a brand-new thing, and I made a lot of friends during that time. Interviewer: Is there anything else you want to share with the ACCESS community? Janet: Well, let’s see. As long as the lift van service is a door-to-door service, hopefully it will last a long time. And Port Authority and ACCESS and all the other carriers work together, it’ll be good. But I tell you, without ACCESS, I don’t think I would’ve done whatever I’ve done. ACCESS has been like a godsend. Oh, one more thing: I’ve been all over this county and rode almost every carrier, just to try them out! [laughs] Well thank you for having me.